Benjamin Marcy-Quay is a doctoral student in natural resources from Ann Arbor, Michigan. After earning his undergraduate degree at Allegheny College in Meadville, Pennsylvania and working for the Department of Environmental Conservation, a masters opportunity in fisheries brought him to Cornell. 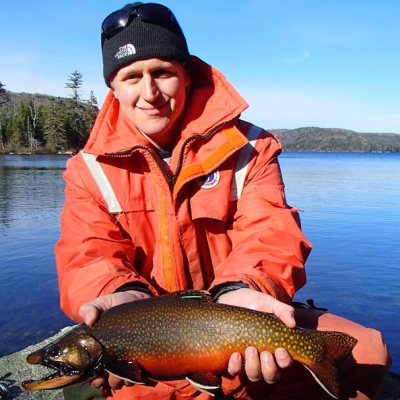 I study populations of native fish in New York’s Adirondacks. In many waters, fish are just starting to recover from the effects of acid rain. I am particularly interested in the population dynamics, i.e. how many there are, the birth/death rates, and the size/age distributions. Knowing more about these things helps to further our general understanding of ecological recovery, as well as how these particular populations are faring. The latter is especially important to managers as the two main species I focus on, brook trout and lake trout, support iconic recreational fisheries. I’ve always been interested in the outdoors, both recreationally and as part of a deeper curiosity about how it all works. As an undergraduate, I studied environmental science and afterwards continued to pursue opportunities that got me outside and doing research. I came to aquatic science by happenstance. A job with the Department of Environmental Conservation led to a M.S. opportunity in fisheries, and I jumped at it. However, I’ve come to appreciate the puzzles this field offers. Water is at the heart of all life but, as mammals, we’re hard-pressed to explain what goes on beneath the surface of even the smallest ponds. You are related to a past governor, for whom Mt. Marcy was named. Can you speak to your family history in New York? Yes, oddly enough I do have a bit of family history related to my studies. While I grew up in Michigan and ended up at Cornell for entirely unrelated reasons, the Marcy side of my family has strong Adirondack roots. I am distantly related to former New York Governor William L. Marcy who authorized the original survey of the region (back in 1837) and for whom the state’s high point is named. More immediately though, that side of my family has had a camp in the High Peaks for over a century. Memories of childhood visits to it add a fun personal aspect to my research. What is it like to be doing research in this region as a graduate student? For someone who enjoys the outdoors, the Adirondacks are a great area to work. Due to the acid rain problems of the 70’s and 80’s there’s a vibrant community of scientists doing work in the region and a wealth of historical data. Plus, it doesn’t hurt that the region is beautiful and getting there isn’t especially difficult. I’m an avid downhill skier, an occasional rock climber and, when I can, I like to hike, backpack, and kayak. I also homebrew and lately have been getting very into cidermaking. In short, I’m an Ithacan stereotype. In all honesty, Cornell was a happy accident. I was in the right place at the right time and an opportunity presented itself. Now that I’m here though, it’s hard to imagine being anywhere else.